Women who served in U.S Military and who meet eligibility requirements can receive their health care at a VA Medical facility. The same eligibility requirements apply to men and women Veterans. 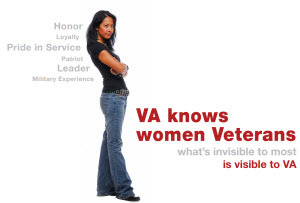 VA actively encourages women Veterans to utilize the benefits they earned. The Women’s Health Clinic is located in 1C North section of the main hospital building immediately adjacent to the Red Clinic. The check-in area is Room 1602 (Red Clinic reception), 414-384-2000, ext. 47177 or 42083. Women’s Health care is also provided at each of our community outpatient clinics. The Womens Resource Center (WRC) is in Building 109, next to the Spinal Cord Injury Center. The WRC is designed to be a safe and welcoming space for women patients. Mental health services focusing exclusively on women Veterans are currently provided there, with both individual and group therapy offered. Please come and visit our new space open Monday through Friday from 8 to 4:00. Maps to find it are available in the Red Clinic or the Welcome Desk at the east entrance or call ext. 43700. Reproductive health care including preconception counseling, maternity care, HIV testing, infertility evaluation and treatment and genetic testing. Click here for our women's maternity and fertility benefits pamphlet. Gender reassignment: VA provides mental health support, endocrine clinic and gynecology. Life Style Coaching: For a pamphlet on our lifestyle coaching clinics contact the clinic. Located in Building 70, between B-wing and E-wing. Hours vary and are posted on the door. The room is available to women Veterans with referral from their social worker or domicillary staff.